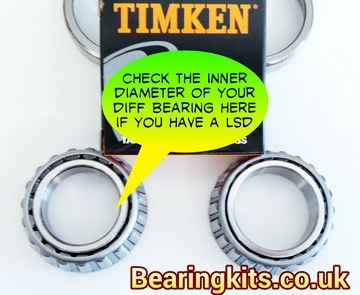 If you have a Tran-x limited slip diff fitted to your Ford English axle you may need to check the bearing sizes when changing them. This will also apply in the future to 3JDrivelines and already to some large spline halfshaft Quaife ATB diffs. You will often find they are about 3mm larger on the inside diameter than the standard Ford type. The pic below will show the difference, hardly noticeable without a measuring tool.